Anyone who says they love the scent of spring flowers obviously hasn't caught a whiff of these stinkers, especially when they are fading. 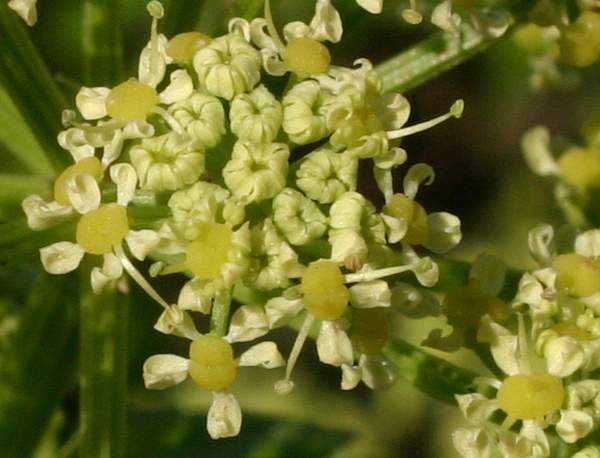 Smyrnium olusatrum is a hairless biennial umbellifer growing to a height of 1.5m. The yellowish-green glossy leaves are divided and bluntly toothed. Young stems are solid but become hollow when old; the upper branches are usually opposite. 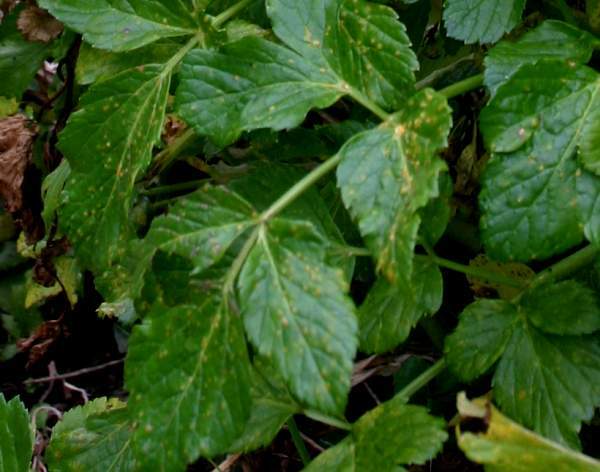 Borne in dense umbels, the yellowish Flowers of Alexanders are hermaphrodite (having both male and female reproductive organs); they have no sepals. The seeds change colour from light green to black as they ripen during July and August.. This Mediterranean plant was probably introduced to Britainby the Romans, who may have used it as a general-purpose vegetable. (The leaves and young shoots can be eaten either raw or cooked, although the bitter taste is not universally popular.) 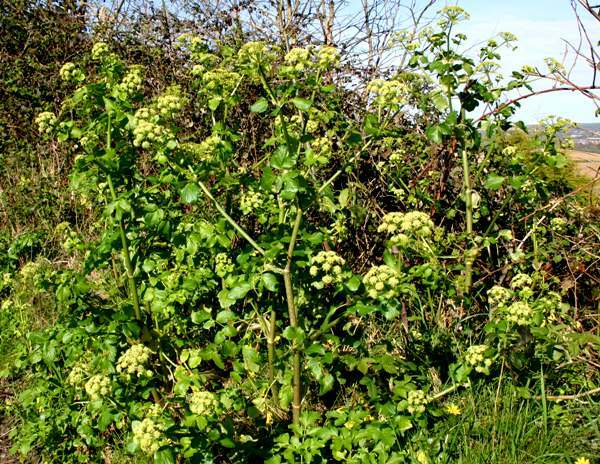 Alexanders grows wild in most coastal parts of Britain and Ireland, and in southern and central Britain it is also found in many inland locations. Further north this warm-climate cannot cope inland with winter's extreme cold, and it is confined to sheltered coastal areas. Particularly were the soil is enriched and has been disturbed, Alexanders colonises waste land, roadside verges, woodland edges, scrub and and cliff tops. Although mainly coastal, this umbellifer seems to have benefited from the salting of roads, and so has moved inland nearly always on or near roadside verges. This mainly coastal plant is a very early blooming member of the family Apiaceae, and you will see swathes of it in springtime along hedgerows and onthe slopes leading down to sheltered coves. The umbrella-like yellow flower heads open in April, and by July the seeds are beginning to ripen and turn dark brown. The generic botanical name Smyrnium comes from the Greek word smyrnion, which means myrrh. 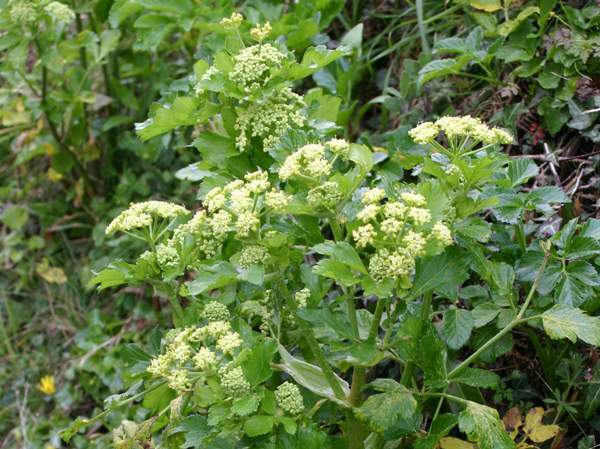 It suggests that the smells of Alexanders and of myrrh may be similar.The specific epithet olusatrum comes from the Latin olus-, a garden herb, and -ater, black - referring to the seeds. The pictures of Alexanders shown on this page were taken in West Wales during April.